Collecting World War II era newspapers covering significant events continues to be popular among collectors, even though the number of WWII veterans continues to decline. Authentic issues of the Honolulu Star-Bulletin reporting the Pearl Harbor tragedy certainly stand above them all. It is with this in mind we are pleased to post the following article compliments of Francisco Mesa. As the years roll by, the list of surviving US veterans of WWII who served at Pearl Harbor when the Japanese Navy attacked the US Navy’s Pacific Fleet inevitably becomes shorter. And with the Pearl Harbor survivors well past their late 80s and some passing even the ripe-old century mark, their numbers are dwindling rapidly all over the US. Last year, just about 2,000 survivors were thought to be around, still. On December 7, 2014, the US President Barrack Obama designated December 7 as the National Pearl Harbor Remembrance Day. Four veterans of the remaining 9 USS Arizona survivors gathered at the Pearl Harbor Visitor Center on December 7, 2014, for a meeting of USS Arizona survivors. The veterans were greeted by music and military salutes from the US Navy Band. Later, they viewed a live feed of an underwater dive beside USS Arizona’s sunken hull that still holds over 900 bodies. For the veterans, each return to Pearl Harbor brings back intense and, sometimes, painful memories. Although it was the last formal survivor gathering of the erstwhile USS Arizona Reunion Association at Hawaii, the veterans said they still intend to get together—if not in Hawaii, somewhere in the US. Louis Conter, 93, felt he still had some time, and he’d come back to the Pearl Harbor Visitor Center regardless of who else makes it. Donald Stratton, 92, of Colorado is another USS Arizona survivor. Don Stratton had been manning the Anti-Aircraft gun batteries. He remained at his battle station on the ship’s port side until the last possible moment. He endured 65 percent burns and a one-year hospitalization. Stratton was medically discharged from the US Navy but re-enlisted a year later. He said that the good Lord saved a precious few from the USS Arizona. John Anderson, 97, was ordered off the USS Arizona, but he wasn’t willing to leave behind his twin brother, Delbert. Although Anderson was forced into a boat and packed off to the safer Ford Island, he returned in an empty boat and rescued three shipmates. Sadly, he didn’t find his brother. Anderson recalled that he had just attended church services that day and had been heading to breakfast when someone warned that the Japanese planes were coming. Anderson remembers lying in a bomb-blast crater on Ford Island after the surprise attack. He had picked up a rifle and two bandoliers of ammunition and started firing at Japanese aircraft. Anderson had hunkered there through that night with another sailor. 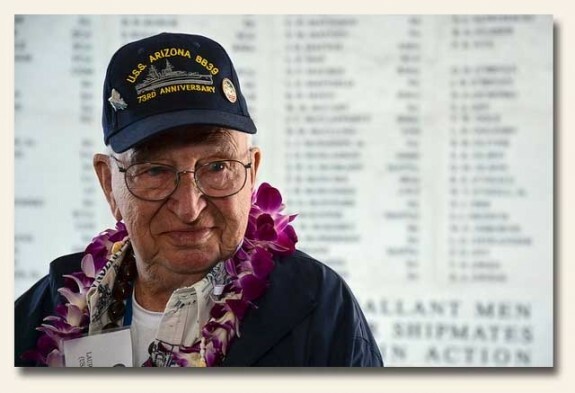 In the morning, a passing Marine patrol informed him that survivors of the USS Arizona had to gather at the dock nearby to facilitate a head count. Anderson remembers everyone he saw having rags around their heads. He clearly recalls bandages covered their arms and their skin had been scorched, and their hair had been burned off. Lauren Bruner, 94, had been alongside Don Stratton manning his battle station. There were four others as well. Bruner had escaped from the fiery, sinking battleship by shimmying across a rope that dangled 60 feet above Pearl Harbor’s waters. Bruner had been standing just 70 feet from the spot the torpedo bomb had exploded at the USS Arizona’s forward magazine. He suffered almost 75 percent burns. But that didn’t deter him. Bruner and his comrades were intent on fighting back. There was only one thing that hampered them … they just had to survive the next few moments. So, after catching the attention of one sailor aboard the warship moored alongside their own, a rope stretching almost 100 feet was thrown across. All the 6 men made the painful—all of them had suffered serious burns—hand-over-hand escape. They had dangled 60 feet in the air as huge flames rising from the oily harbor had burned their skin even more. Bruner had been the second last to leave USS Arizona. Alvin Dvorak, the last one to escape over the rope, had been the one that caught the attention of the sailor on the USS Vestal. Unfortunately, Dvorak succumbed after spending 17 days in the hospital. He had suffered 84 percent burns. Lauren Bruner considers Alvin Dvorak to be the true hero of their great escape. Bruner spent the next seven months in the hospital and returned to the Pacific theater. Although the survivors of Pearl Harbor are in their early or mid 90s, they can recall the Japanese sneak attack vividly. Many of the survivors fondly hope to live long enough to attend the 75th anniversary of the Pearl Harbor strike in Hawaii on December 7, 2016. If you are ever visit Hawaii, there are several Pearl Harbor tours that range from just a couple hours to a full day. There are still droplets of oil coming out of the sunken battleship USS Arizona. Also, there are hundreds of people still entombed within the sunken battleship. It is said that the droplets of oil represent the crying of the fallen men and women. And when the droplets of oil stop, the crying will stop.